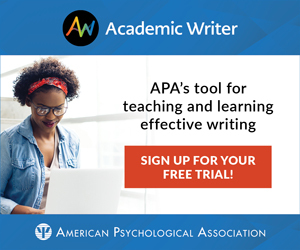 Funding from APS helped basic science researchers team up with educators to create the interactive teaching module Developing a Taste for Perceptual Psychology. No two people perceive a particular food in exactly the same way. Discoveries in genetics and psychology point to genetic variations in taste and smell receptors as root causes of individual differences in taste and smell. These two senses are the primary ways in which humans perceive food flavor (a conglomerate of taste and smell), although learning and experience also play important roles. Recent discoveries have changed how scientists view the perception of taste and smell, but these discoveries, like so many others, have been slow to come to the classroom. There is a critical need to accelerate the speed at which scientific advances enter the classroom, especially discoveries that cross traditional scientific disciplines — in this case, biology, psychology, genetics, and chemistry. The APS Fund for Teaching and Public Understanding of Psychological Science awarded a grant to Danielle R. Reed, a basic science researcher at the Monell Chemical Senses Center , and Scott Stein, an experienced teacher and high school administrator at Springside Chestnut Hill Academy in Philadelphia, to support the creation of an in-class teaching module entitled Developing a Taste for Perceptual Psychology, which was refined by University of Pennsylvania student Mary Xia. They also developed a website where teachers can get the materials needed to teach the module and students can upload and share data with other students from around the country. The teaching module has an attractive hook for students — bringing food into the classroom as a method to teach science. 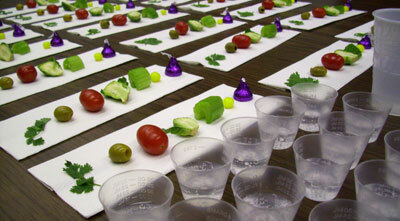 Students taste and smell their way through a “mini-meal” of common foods, such as cilantro, olives, Brussels sprouts, chocolate, and tonic water, rating each for intensity and liking. 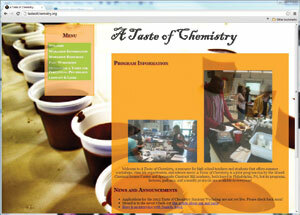 Students can then analyze their data to highlight the differences in taste perception among people. They can also compare their findings with data uploaded to the website by other students who have already participated in the program. Through the support of the APS Fund for Teaching and Public Understanding of Psychological Science, a new program to bring sensory and perceptual science into the classroom now connects scientists and teachers to better learn about and teach perceptual psychology. The Developing a Taste for Perceptual Psychology website provides a virtual venue for data collection and analysis and gives teachers and students alike an opportunity to use a fun and informative teaching module, to explore the most recent knowledge in chemosensory psychology, and to share data with other teachers and students. Tasting food in the classroom creates opportunities to teach perceptual psychology because it involves a complex stimulus that can be broken down into parts — the sour of acids, the saltiness of sodium chloride, the savory taste of proteins, the bitterness of quinine in tonic water, and the sweetness of sugar in chocolate. It also helps students identify locations of taste and smell receptor cells — the tongue and taste buds, and the nose and olfactory receptors. Students also learn that, much like some people are color-blind, some people are taste-blind or smell-blind to some of the flavor molecules in foods; this is likely due to genetic variations. Along with these classical stimulus-response lessons, the module also allows teachers to reinforce the importance of the brain, memory, and learning in sensation, wherein expectations, knowledge, and culture play a role in determining the liking for foods rather than solely the innate sense of taste and smell. The mini-meal foods are chosen to be perceived in different ways based on genetic variation and also to be familiar to some students and unfamiliar to others. Tasting food in the classroom can create challenges, and students with allergies, food restrictions, or extreme food neophobia are instructed to skip foods as appropriate. In addition, “picky eating,” which has not been well-studied but is common, especially in children and adolescents, is well-illustrated by using a variety of “unique” foods to provide a springboard for further student research and discussion. This program has expanded to include a related teacher training workshop called A Taste of Chemistry, which is funded by the Camille and Henry Dreyfus Foundation and is taught by Stein and Reed and assisted by Rebecca James, a University of Pennsylvania undergraduate. Here, teachers are trained in taste psychology and biology with a focus not only on genetics and individual differences, but also on the study of bitter receptor genotypes and the perception of certain bitter compounds. Reed and Stein have also prepared and submitted an application to the National Institutes of Health Science Education Partnership Award (R25) to expand the workshop, as well as to increase the bandwidth of the Developing a Taste for Perceptual Psychology website and to enhance its capacity for data analysis and graphics. Please add me to your list serve to receive future information regarding programs like these. Although I have taught for twenty years, I was reassigned this past year to teach AP and Psychology courses. Looking for engaging and meaningful lesson ideas! Are there any materials for this still available online? Danielle R. Reed, Monell Chemical Senses Center, studies the relationship between genotype and phenotype in both humans and rodents, and how development and environment can affect those relationships. Her ongoing work is aimed at understanding the heritability and molecular underpinnings of obesity and fat patterning. She can be reached at reed@monell.org; Mary B. Xia is an undergraduate student at the University of Pennsylvania and is a member of the lab staff at the Monell Chemical Senses Center.